As the world becomes more hectic and confused, it is important for people to take time to "stop and smell the roses." Art, and a person's self-expression, are ways to ease tension and strain. In addition to personal satisfaction, art also is an important business, whether the artist works for himself or for a commercial firm. 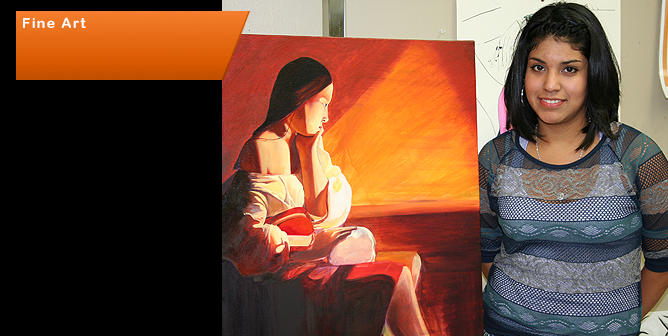 The Associate of Arts degree from Cowley offers an introduction to various artistic media. Drawing, design, painting, sculpture and ceramics are courses that illustrate the artistic diversity to students. General education courses such as art appreciation, history, literature and problems in art help round out the art major's years at Cowley. Elective courses give students an opportunity to construct individualized programs. The Associate of Arts degree earned at Cowley provides a sound academic base for further study at a four-year school. With the completion of general education at Cowley, students can specialize in their chosen area when they transfer to a four-year school. Counselors at Cowley are helpful in setting up a transfer program to four-year colleges and universities in Kansas. Students interested in out-of-state schools should work closely with Cowley's teachers and the transfer institution to ensure a smooth transition.